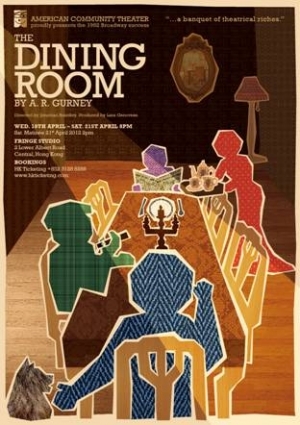 The play is set in the dining room of a typical well-to-do household, the place where the family assembled daily for breakfast and dinner and for any and all special occasions. The action is comprised of a mosaic of interrelated scenes - some funny, some touching, some rueful - which, taken together, create an in-depth portrait of a vanishing species: the upper-middle-class WASP. The actors change roles, personalities and ages with virtuoso skill as they portray a wide variety of characters, from little boys to stern grandfathers, and from giggling teenage girls to Irish housemaids. Each vignette introduces a new set of people and events; a father lectures his son on grammar and politics; a boy returns from boarding school to discover his mother's infidelity; a senile grandmother doesn't recognize her own sons at Christmas dinner; a daughter, her marriage a shambles, pleads futilely to return home, etc. Dovetailing swiftly and smoothly, the varied scenes coalesce, ultimately, into a theatrical experience of exceptional range, compassionate humor and abundant humanity.